Nokia 9, HMD Global’s next flagship smartphone has been in the news for the last few months. Thanks to the leaked renders and images that keep appearing on and off. Now, a Finnish site Suomimobiili has leaked out a complete specification sheet of Nokia 9 that lists all the expected features in the upcoming smartphone. The leak also reveals a picture labeled “camera revolution” of the upcoming Nokia 9 flagship by HMD. 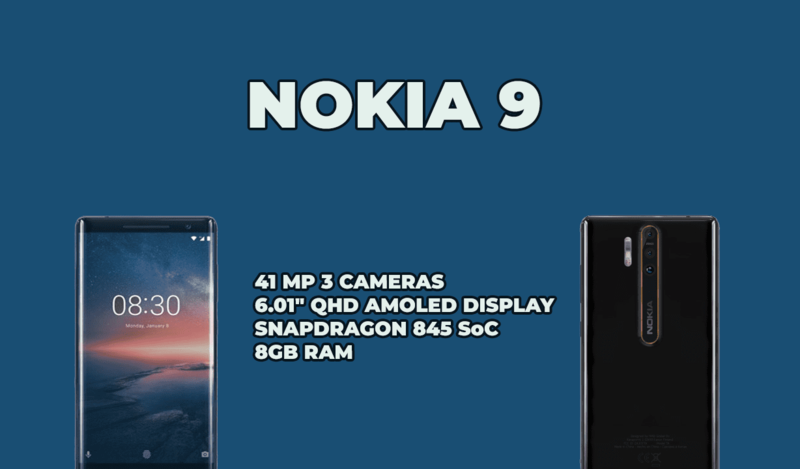 According to the latest leak, Nokia 9 suggests to have features that can give tough competition to Samsung Galaxy S9 or the recent Apple iPhone X. Nokia 9 may feature a 6.01-inch QHD AMOLED display panel with 18:9 aspect ratio and Corning Gorilla Glass 5 protection. The smartphone is said to give “more display area in the same footprint as a traditional 5.5-inch device”. The device will be powered by Qualcomm Snapdragon 845 processor, coupled with 8GB RAM and 256GB of internal storage. The spec sheet suggests the device would measure 150.6 x 75.2 x 7.3 mm and have an 18-karat gold trim on the rear panel. Nokia 9 will feature a huge ZEISS 41MP primary wide-angle camera with Xenon+ LED flash, which was previously seen on the Nokia 808 PureView. The secondary lens will be a 20MP Telephoto lens with OIS (Optical Image Stabilisation) and variable f/1.5/f/2.4 variable aperture. It will also have a 9.7MP monochrome camera with ZEISS optics to complete the triple-camera setup. The main camera of Nokia 9 comes with 4x optical zoom support and an LED flash and may feature a 21MP sensor on the front with f/1.8 aperture. The Nokia 9 will feature the company’s proprietary Dual-Sight Bothie, apart from a Pro Camera mode. The handset will provide Qi wireless charging support, which is expected to deliver 60 percent charge in 30 minutes. The smartphone will also pack a massive 3,900mAh battery that could provide a standby time of 565 hours and talk time of up to 24 hours. Nokia 9 will use a USB Type-C slot for charging. The device will come with an IP68 rating, making Nokia 9 water and dust resistant. The smartphone is tipped to run Android 8.1 Oreo out of the box. Connectivity options on Nokia 9 include Wi-Fi 802.11 a/b/g/n/ac, Bluetooth 5.0, GPS/ A-GPS, Glonass, USB Type-C, and NFC. The specifications sheet also notes the use of five high-performance microphones capable of recording audio in 24-bit. It is sporting the Android One branding on the rear as well. The smartphone could support an in-glass fingerprint reader, G-sensor, e-Compass, Gyro, Hall sensor, and barometer. Notably, HMD Global has not confirmed any of the above-mentioned details for Nokia 9, so the report should be taken with a pinch of salt. The Nokia 9 was previously anticipated to be launched by HMD Global unveiled at the MWC 2018 in Barcelona, but HMD Global launched the Nokia 8 Sirocco instead. Several leaks and rumors had surfaced on the internet before the event, but the handset never made its way into the launch event.